Learning to ride a Balance Bike is a BIG DEAL in the life of a youngster. 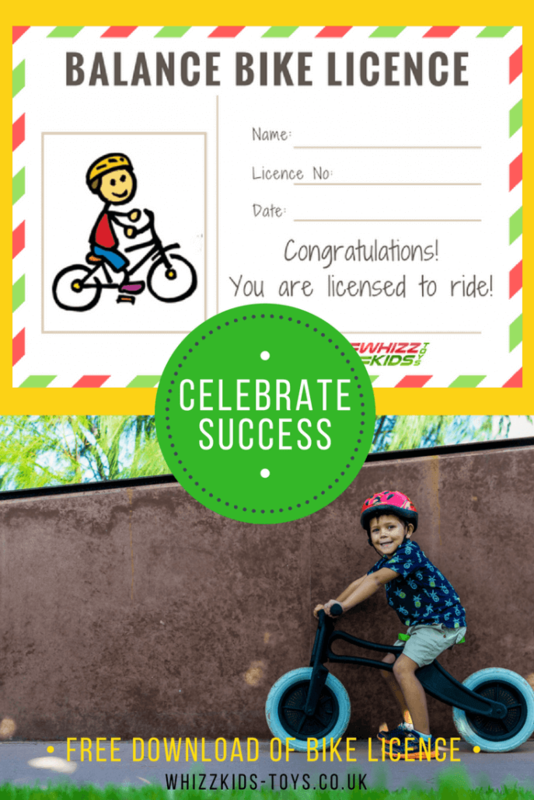 And it’s great to be able to celebrate that success by giving them a Balance Bike Licence. They will feel so proud of themselves and rightly so! It doesn’t really matter what your criteria is for the licence. It could be when they first learn to truely balance on their bikes by lifting their feet off the ground and coasting. When they can confidently bike a certain distance near your home. It could be when they’ve been on their first family bike ride. Completed 5 family bike rides. I give out these licences to the kids at schools that do Ride a Bike Activities after a block of lessons. I’m amazed by the improvement that I see in the Nursery and Reception children when they have weekly lessons on bike handling. Learning to negotiate their bikes around gentle and tight bends, over rough surfaces such as rumble strips and up and down hills of our ramp. Not to mention learning to put on their bike helmets and check their bikes for safety before the ride. 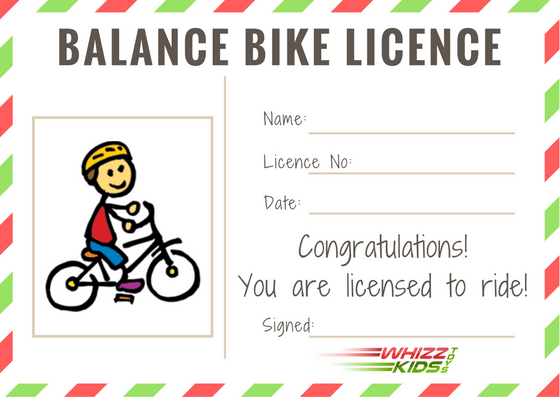 If you have a biker who might be ready to receive their Balance Bike Licence, why not download a high quality A5 PDF printable version below and have an award ceremony at your place soon! Do leave us a comment below if you’ve used this resource, we’d love to hear how they liked it. Got a friend who has a budding biker that might be ready for their Balance Bike Licence? Share this post. I’m always happy when I know there are lots of ‘Whizz Kids’ around! 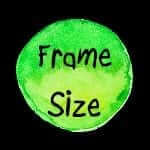 I was chatting with some parents at a Bike Circuit Event that I was running on the weekend in Devon and several of them were asking which bike size would be best for their children to start riding on? It’s a common question so hopefully this article gives you some pointers. I certainly recommend starting with a balance bike of some description and not using a bike with stabilizers if you can help it. See my post on the reasons why Stabilizers teach your children bad habits. Kid’s bikes are sized by their wheel diameter in inches rather than frame size. Be careful when looking at just age ranges for bikes as children vary hugely in height so they might be too small or too tall for that specific bike. Measuring your child’s height or their inside leg is a much better indicator. You want your child to be able to sit comfortably on the seat with their feet on the ground and a slight leg bend. They should be able to reach and manoeuvre the handle bars with ease. It’s always tempting to buy a bike that your child will grow into but be wary of this as a bike that is too big and unwieldy is potentially quite dangerous for your child. You want their first biking experiences to be positive ones! Also remember that different brands of Balance Bike have different size frames even though they may have the same size wheels. For example, with 12″ wheels, the Strider 12 Sport or Pro models are suitable for a small to average size child. If your child is on the higher height percentiles, the Wishbone brand bikes have a larger frame size. Or you may want to consider a 14″ wheel size and look at the Strider 14X Sport Balance Bike/Pedal Bike or Wishbone Cruise. See my post Which Balance Bike is Best for my Child? if you want to find out more about the differences between bikes. 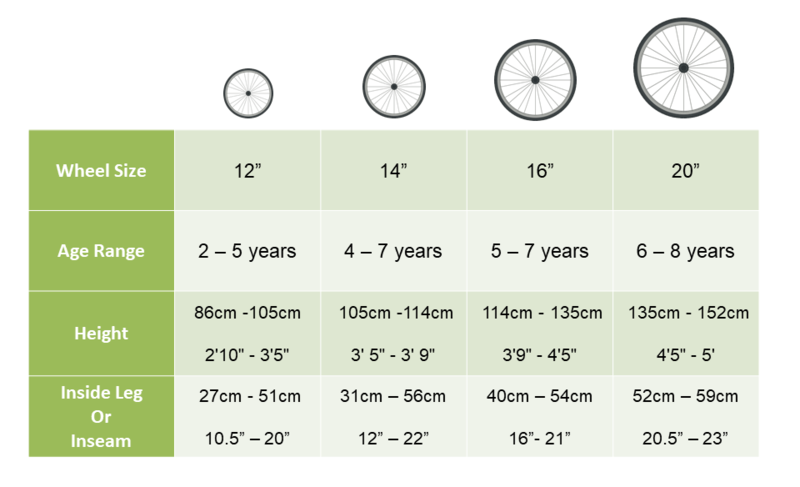 The table below gives you an indication of which size to start with and move onto as your child grows and develops their biking skill. 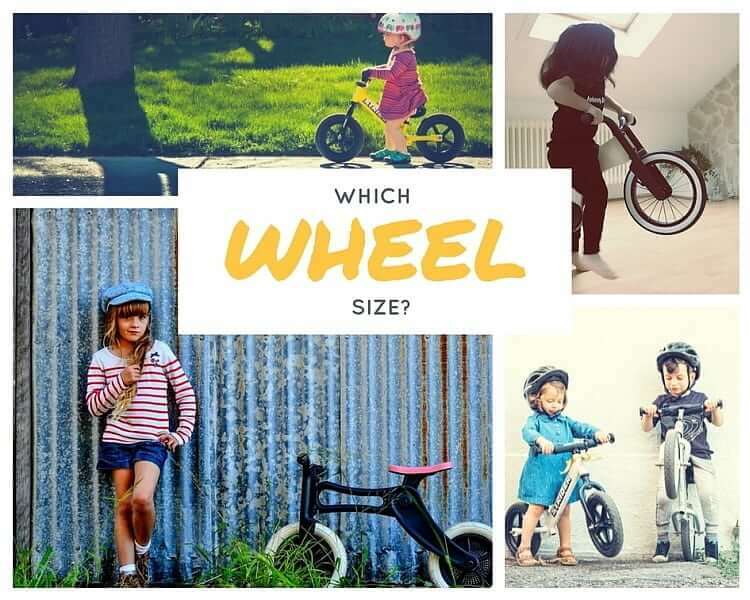 Generally you would look for them to start on a 12″ wheel Balance Bike although if you have a 5 year old or tall 4 year old that is just starting out on their biking adventure, you’d probably be looking at the 14″ wheel size as their starting point. 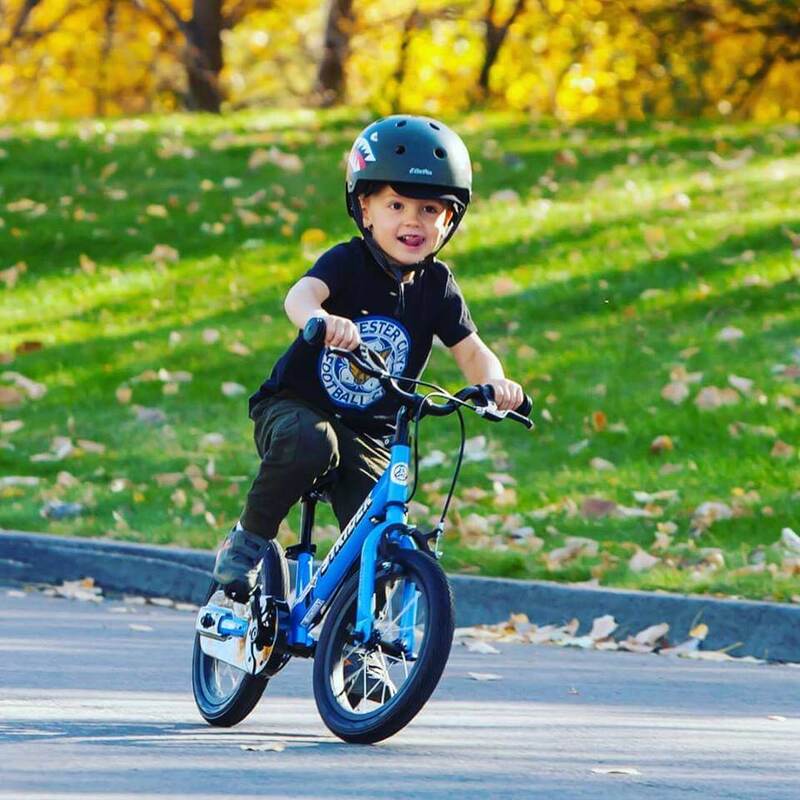 Once they’ve mastered the balance bike and have been confidently biking around on that for a a few years or have outgrown that frame size, the next step would be to look for a 14″ or 16″ pedal bike depending on what age and height they are when ready to make that transition. Some children are ready to make the move to a pedal bike at 3 years old, others need more time and practice and aren’t ready to progress until they are 6 or 7 years old. Don’t be too much of a rush for them to move onto pedals. They can be very speedy on a balance bike! Combined Balance Bike and Pedal Bikes are about to launch in the UK. 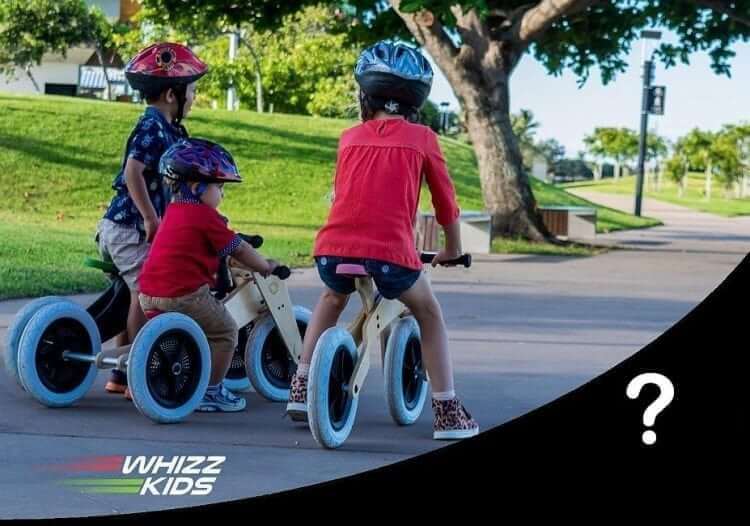 Some exciting news about developments in the Strider and Wishbone brands of balance bikes is that they are both bringing out bikes in the next few months that have a pedal attachment. This means that your chosen balance bike can now be their first pedal bike too so will last for longer. A bonus for your child and your pocket! The Strider 14X Sport Balance Bike/Pedal bike is now our web shop to pre-order for delivery at the end of August 2018. Check out some action of the Strider 14X Sport below which is the new combined Balance Bike/Pedal Bike from Strider. The UK version will have hand brakes fitted too. You’ve made the decision that you want to buy a balance bike for your youngster, great choice, you won’t regret it! Check out my post Stabilisers are Teaching Children Bad Habits if you want to read the science behind the benefits of balance bikes. Next comes the research to figure out which one will be the best one to buy. Balance bikes come in a gorgeous array of makes and models these days which is great….although it makes sifting through the many options a little more work. I’ve tried to save you some work highlighting the key points that you might want to consider. The size of the frame varies from model to model so it’s important to pick a bike that has a frame size that fits your child now but also comes with adjustability in the seat and possibly handlebars to ‘grow’ with your child. Some balance bikes such as the Wishbone Bikes have a larger overall frame so suit a child who is of average height or above for their age. Strider Bikes have a smaller frame size so suit those toddlers who are more petite. There is a choice of Nylon, Wooden, Aluminium or Steel for the bike frames. All come with their pros and cons. Nylon is a great tough option and, with glass fibre re-inforcement, has extra strength. The Wishbone Recycled Edition Balance Bike or Trike are super sturdy and have stainless steel axels now too so they can be left outside with no problems. Wooden bikes are nostalgic, yet relatively hard wearing options. For the eco-conscious out there, Wishbone Original Bikes come from sustainable birch wood plantations. The downside of wood is that it doesn’t appreciate being left outdoors day and night and adds a little more weight to the overall balance bike. Steel bikes are tough and sturdy and a good value for money. Check out the STRIDER Balance Bike range which has bikes that weigh in at 3kg. Aluminium bikes are light and with an anodised paint finish, they have the benefit of not rusting or chipping paint. Bikes with these frames would be the lightest on the market like the STRIDER Pro Balance Bike. Air filled Rubber Tyres, Foamed Filled Plastic tyres or Solid Rubber Tyres are the main 3 options in the market. Air tyres offer a much better riding performance and if you’re planning on doing a fair bit of biking, these are definitely the best option. The bike is springy and therefore much more comfortable, and the air cushioning cuts down the vibrations going through to your child. A bonus for their rapidly developing little bodies. 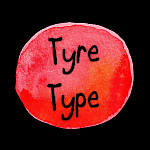 The rubber tyres also have good grip on the surface, whether it’s wet or dry. Solid polyurethane (EVA) tyres don’t have as much spring or grip as the air tyres. These types of tyres are best used on smooth surfaces such as playgrounds, skate parks or concrete tracks and over short distances. You have lower maintenance with this tyre type but the trade off is a less comfortable ride. Wishbone bikes all have non-marking rubber air tyres which give a great smooth grippy ride but do add a little extra weight to the overall bike. 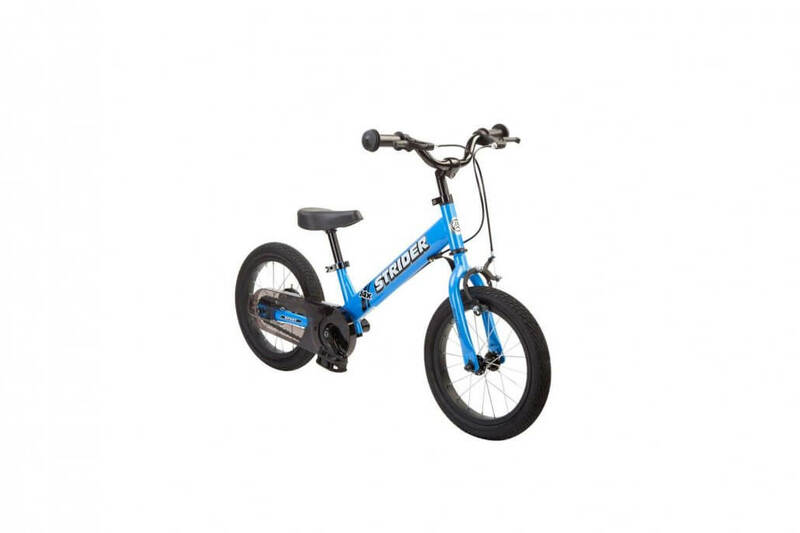 Strider 12 Bikes come with foam filled tyres by default but you can upgrade to air tyres when your child gets more confident and does a lot of biking or is a little older and bigger to handle them. The Strider 14X has 14″ air tyres (pneumatic) as standard. So, hopefully that gives you a little more information on which bike to pick. Of course, your kids have a BIG say in the decision making too! If they love the look of the bike, they’ll more likely want to pick it up and whizz along! Feel free to contact me if you have any questions or queries about a make or model of balance bike that you’re considering. Always happy to help get your youngsters moving! I’m a child of the seventies and remember, with the nostalgic fuzziness of time, learning to ride a two wheel bike. A rite of passage that most children go through which offers, once mastered, a sense of divine freedom to explore the neighbourhood. Not to mention the amazing array of gross motor skill development that goes with it! Mix that memory with a good dollop of stress on both the child and parents’ part, plenty of bruises and scabs from frequent tumbles, many months of trying, a gradually building back problem for the parent and you are close to reality! Learning to ride a bike the old fashioned way was never easy…..and here’s why! Stabilisers (or training wheels as they are known in some countries) were developed to solve the very real problem that it is hard to balance on a two wheeled bike. And being able to ride a bike is such a great skill to have in life. It offers a sense of independence for your child as well as the development of so many gross motor skills. Leg, arm and core strength, balance and endurance to name a few. It gives an opportunity to stimulate their senses, improving sensory processing, and gets your child outdoors which improves mood and reduces stress levels. It’s a cheap method of transport, and is environmentally green. Yes, you could argue that they start to build up some of those skills by riding a bike on stabilisers but dynamic balance is a vital skill. There is a complex set of brain activity going on using many of the sensory and motor control systems. Plus, riding with training wheels forever is not cool! So, at some stage, out comes the tool box and the stabilisers have to go. Then come the tears! To balance a bike requires two main strategies: steering and body movement relative to the bike. The centre of mass of the person needs to be over the frame of the bike. Suprisingly it is the steering strategy that is absolutely necessary to balance a bicycle, whereas body movements are not so vital. If your 2 wheel bike wobbles and leans to the left, you have to turn the handle bars to that same direction to allow the bike to steady itself. It’s totally counter intuitive so no wonder we have a hard time learning to balance on a moving bike. A child on stabilisers never experiences the lean so never learns the correct strategy. Turning Left? With stabilisers on, your child will learn to turn the handle bars left to go left. Common sense right? That’s what they do on any 3 or 4 wheeled ride-on toy that they may have already experienced. So, what’s the problem? If they do that, the 2 wheel bike will right itself and stop the turn. Your child will be learning something that they will have to then unlearn. If you want to steer your bike to the left, you have to counter steer to the right first, then steer to the left and your bike will go left. Science is weird sometimes! You and I won’t even notice that we do this because it is a subconscious action, but your child will have to learn this concept the hard way once the stabilisers come off. This is often the reason that it can take months and sometimes up to a year of stress for your child to master it. Learning to balance is a hard skill, not to mention learning to balance on a moving object. It’s so much easier to balance first, then learn to turn the pedals afterwards than learn to pedal first then try to figure out how to balance and steer. Balancing a moving object is a much harder concept to grasp than turning pedals. So….what are the alternatives to stabilisers? Balance Bikes have been around for a couple of decades but are becoming increasingly popular for a very good reason. I absolutely love them as a concept! 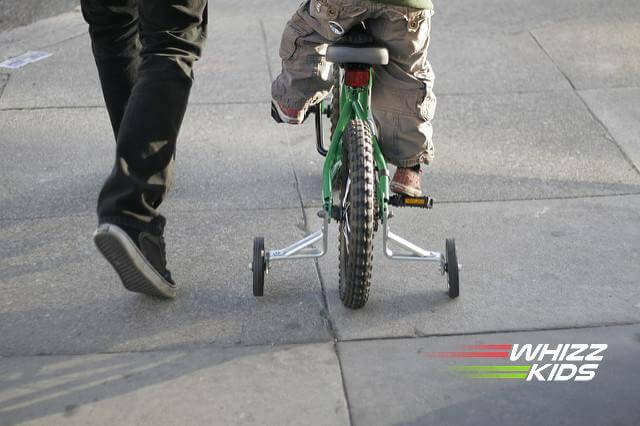 They are basically a bike frame without any pedals or chain and allow your child to figure out how to balance literally step by step. No stress, no tears, no anxiety. A child can learn to balance a two wheel bike in as little as a few hours. Their feet comfortably touch the ground and initially, it looks like they are just taking their bikes for a walk. They use their feet to propel themselves forward and little by little, increase the time that both feet are off the ground until they are essentially balancing. Give them a few weeks and they’ll be confidently scooting along having figured out the whole counter intuitive steering/balancing issues. Kids on balance bikes can travel so much faster than on a heavier bike with training wheels, so they can join in with family bike trips, or ride alongside the jogging or walking parent with ease. Once they are confident on the balance bike, they can progress to their first pedal bike with no dramas. My son was up to speed by 3 1/2 years and it took just two goes before he set off on his new Trek pedal bike. His grandparents stood by looking sceptical until they saw him zipping around. They are now total converts to my balance bike mantra! There are so many choices out there in the market at the moment. 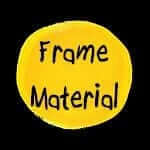 You can choose a wooden, steel, aluminium alloy or synthetic frame. The bikes can have air or foam filled tyres. And there are plenty of cool accessories to personalise their ride. Some people question the cost and value for money. Fair comment, most aren’t cheap. But, if you took the cost of a tricycle and a 12″ pedal bike with stabilisers, I reckon that you would have spent more than the cost of one balance bike. That’s all from me for this time. Stay active!